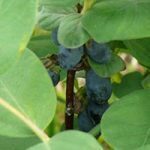 These small shrubs, growing to 1.5 m (5 ft) high, are grown commercially for their edible, blueberry-like fruits in several countries. They are extremely hardy. Grow two or more varieties for cross pollination.